"You don't want to kill innocent passengers do you?" 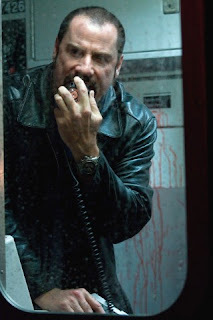 Starring Denzel Washington and John Travolta, The Taking of Pelham 123 is about an ex-con (played by Travolta) who hijacks a NYC train in exchange for $10,000,000 in one hour or else the hostages die. His reluctant accomplice is an MTA official (played by Washington) who quickly becomes Travolta's only connection to the office above ground and with whom he can ensure his demand was executed smoothly and hastily. As Washington acted as an amateur hostage negotiator, struggling to deflect Travolta's insanity, before he knew it Travolta played into his weaknesses and later had him right where he wanted him--by the balls. As the clock counts down, the MTA scramble to make meet the hijacker's deadline before any blood is shed, and the hostages plead for their lives. Travolta was pretty good as the psycho train rider, but I wish his character had more depth. Like, what was his problem anyway? I know a lot of crazy folks are just plain crazy for no reason, but I feel like that wasn't the case with him. We needed a little more background on him. Without it, the performance fell a bit flat. I love Washington as an actor, but I do have to admit I'm getting kinda tired of seeing him play the same type of roles where he assumes some sort of police work and ends up saving the day. I'm ready to see him steer away from that for a bit. Overall a good movie, good performances, got your adrenaline going. Thanks for this review Candice. I was curious about this remake. I loved the original and hope this version has the same unexpected humour. This movie was unexpectedly HYSTERICAL!! !I love Travolta's humor! I think the Travolta back story was supposed to have been that lightbulb moment by James Gandolfini, but yea, it was weak. I am with you on Denzel as the reluctant hero, I kinda wish he was the bad guy this time around!